Samsung has unveiled the SimBand, a reference platform designed to help other smart watch makers track health statistics like blood pressure and oxygen levels. As a reference design, SimBand isn't likely to make it to market – at least not in the way we saw it at Samsung's Voice of the Body event. Instead, Samsung plans to allow third-party software and hardware partners to base devices around it. 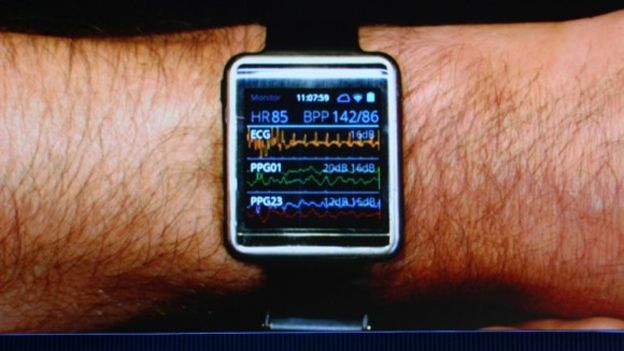 The prototype device Samsung showed off at the event has the ability to track a number of statistics, including heart rate, blood pressure and oxygen levels. Other specifications of the prototype device include a 14x34mm body, a 1GHz 2x ARM A7 28nm chipset as well as Wi-Fi and Bluetooth support. It also comes with a removable battery so it can be charged when it isn't being used – such as when the user is sleeping. According to Samsung, its goal with the product is to create “a common platform for wearable sensor development”. An SDK for the platform is expected to be released later this year.